I was never a big fan of casseroles. Aside from a good lasagna or baked cannelloni, I never really saw the appeal of this type of American cuisine. Casseroles from my childhood experience were often times mushy, homogenous and bland despite being doctored with cans of condensed soup. I mean, has anyone actually sat down and let their taste buds decide whether that is a good idea? What’s the point? You could easily throw together a decent meal complete with entrée and side dishes in the same amount of time it takes to bake a casserole and, I always thought, that meal would also taste so much better. However, big casseroles make my husband’s heart skip a beat and because this family practices democratic ideals (and meals), I am not completely heartless. I oblige his food wishes from time to time but only on my food-fascist terms. These rules are fairly simple and gastronomically pure: the dish must be tasty, not made with too many processed food ingredients and I decide what goes on top. So, after some brainstorming, I concocted this recipe. 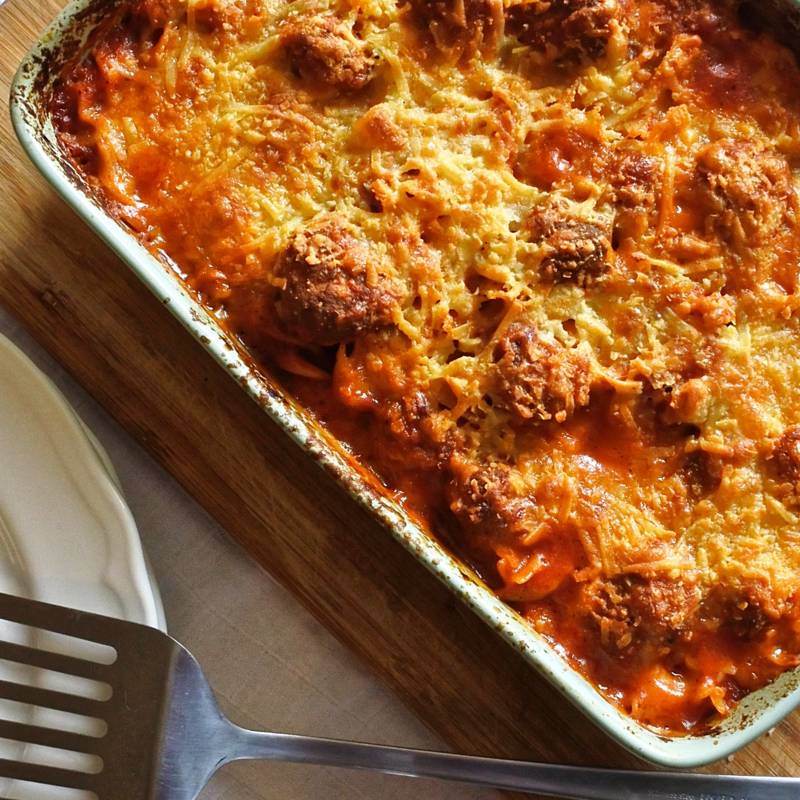 Roasted tomato and red pepper sauce with meatballs which is a tasty and fairly straight forward meal that is actually complimented by being baked with pasta. The sauce is easy to make and packs a tasty punch. For added fun, I smother it in cheese because many foods, this included, just look better when coated with melted cheesy goodness. The result is a family favorite which has forced me to reconsider the appeal of the good old fashioned casserole. Roughly chop up red bell peppers, tomatoes and garlic cloves and place in a baking tray. Sprinkle with olive oil, salt, pepper and italian herbs. Add a splash of red wine and toss until everything is evenly coated. Place in the oven and cook for 1 hour at 450F/220C. When finished roasting, puree the red pepper and tomato mixture using a blender or food processor until smooth. Transfer to a medium-large saucepan and cook on medium heat until bubbly. Cook the pasta until al dente, drain thoroughly. Add to sauce mixture with meatballs and gently fold it all together. Transfer pasta mixture to a baking tray, top with your favorite shredded cheese and bake in the oven at 450F/220C for 15-20 minutes or until cheese is melted and brown and the pasta has soaked up some of the sauce. When finished roasting, puree the red pepper and tomato mixture using a blender or food processor until smooth. Transfer to a medium-large saucepan and cook on medium heat until bubbly. In a large mixing bowl, add together all ingredients and thoroughly combine. Using your hands, shape the mixture into balls 1 in/2 cm in diameter. When the red pepper and tomato sauce is bubbly, add the meatballs, cover with a lid and let cook in the sauce for 10-12 minutes or until cooked through. (I like my meatballs to taste like meat so I add just enough egg and breadcrumbs to keep the mixture together. If you don’t feel the same way, feel free to add more egg and breadcrumbs.) TIP: To avoid dry meatballs, use meat with a little bit more fat on it. You want just enough fat to keep them juicy but not too much fat that it’ll make the sauce greasy when poaching them. Cook the pasta until al dente, drain thoroughly. Add to sauce mixture with meatballs and gently fold it all together. Transfer pasta mixture to a baking tray, top with your favorite shredded cheese and bake in the oven at 450F/220C for 15-20 minutes or until cheese is melted and brown and the pasta has soaked up some of the sauce.